Sentosa  is an island just off the southern coast of Singapore. Formerly known by the rather unattractive name of Pulau Belakang Mati ("The Island After Death" in Malay) and the centrepiece of Britain's unsuccessful "Fortress Singapore" strategy in World War II, Sentosa has been rebranded and resculpted into one big tourist attraction, popular among Singaporeans as a quick island getaway. The new jewel in the crown is Resorts World , an enormous complex comprising a Universal Studios themepark, Singapore's first casino, shopping malls and hotels. The small southern islets of Kusu Island, St. John's Island, the Sisters Islands and Pulau Hantu are managed by Sentosa. Various plans to develop them have not come to much and they remain off the beaten track, but by no means undiscovered. The first two can be reached by public ferry, for the rest you will have to charter a boat. Basic admission to the island will set you back at least $2 per person which is included in the transportation fares from the mainland to Sentosa. There is an ever-changing palette of combination tickets that may work out marginally cheaper if you plan to visit multiple attractions. The island itself is open 24 hours a day, 365 days a year, although many of the attractions are not. By taxi or private car, you'll need to pay $2 to $7 per vehicle to enter, and a $3 taxi surcharge also applies on the way out. It is now possible to walk across the bridge via the Sentosa Broadwalk (free at least until 31 Dec 2018, normally $1, EZ-Link accepted) . The Cable Car  between Sentosa, HarbourFront and Mt. Faber has completed its renovation and reopened to public in July 2010. Return ticket on Cable Car costs $29. Sentosa's ferry terminal has been demolished to make way for the casino, but there are still limited ferry services  from Singapore's Marina South Pier (bus 402 from Marina Bay MRT) to the southern islands of Kusu and St. John. Monday through Saturday, there are two services a day, leaving at 10AM and 1:30PM, looping to Kusu, St. John, Kusu again and then back to Marina South. This gives you one hour on Kusu, which is plenty for seeing the sights. On Sundays and holidays only, there are five services, at 9AM, 11AM, 1PM, 3PM and 5PM, which run to Kusu, St. John and then return directly to Marina South, giving a minimum of two hours on any island you go to. All ferries cost $15 return, no Sentosa entry fee needed. 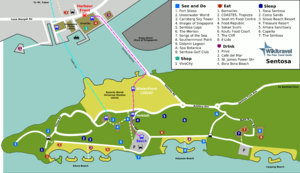 All internal transport around Sentosa (except taxis) is free. Since Stagecoach took over the whole Sentosa bus services because of the exit of FirstGroup's strategy in June 2013, Stagecoach has provided three services in Sentosa. These are bus 1, bus 2 and bus 3. Beach trams supplemented by minivans shuttle people along the beaches every 15-20 minutes. One service connects Beach Station to Siloso Beach, another connects Beach Station to Palawan and Tanjong Beaches. The old round-the-island Sentosa Monorail was decommissioned in March 2005 to make way for the new Sentosa Express, which can also be used to shuttle between the beaches and Imbiah Station (near the Merlion). Long a bit of a joke — Singaporean wags like to quip that "Sentosa" actually stands for "So Expensive and Nothing to See Actually" — Sentosa's attractions have received some much-needed upgrades in recent years, with the worst of the lot unceremoniously demolished. Offerings of interest to adults are still quite limited, but at there's enough to keep children amused for a day or two. For all attractions below, a "child" is defined as being between three and twelve. There are a few sights of minor interest on Kusu Island, reachable by ferry. The name means "Turtle Island" and there are indeed lots of the reptiles scampering about, but don't expect an unspoiled tropical paradise: the island was thoroughly reworked with land reclamation in 1975 and looks exactly like the rest of Sentosa. Resorts World Sentosa can be reached via the Waterfront station of the monorail or via the dedicated "RWS" buses from Harbourfront and other points in Singapore (see Get in). Most people feel they can see Sentosa in a day — how about being confined to the island for over twenty three years? This was the fate of Chia Thye Poh, a member of the opposition Barisan Sosialis, who was arrested in 1966 under the Internal Security Act. He was asked to sign a document renouncing violence and ties with the Communist Party of Malaya, but Chia, a man of principle, refused as he had no such ties and had never advocated violence. Never charged or brought to trial, he was held in prison for 23 years, becoming the world's second-longest-serving political prisoner after Nelson Mandela, and was "released" only in 1989 to house arrest on Sentosa. He was allowed to move back to the mainland in 1992 and had all restrictions lifted in 1998. Among Singaporeans the most popular reason to go to Sentosa is to hit the beaches: Siloso, Palawan and Tanjong from west to east respectively. Unfortunately the water is rather murky due to the neverending parade of ships across the Straits. Siloso has a nice beach promenade full of clubs and restaurants, some rather noisy, while Palawan claims to be the southernmost point of continental Asia (if you count the bridge connecting Sentosa, and ignore any competing Malaysian claims). Tanjong, the quietest of the three, is the place for beach volleyball and also hosts the low-key beach club KM8 (see Drink). The nearby islands of Kusu and St. John also offer some beaches, which are quieter but otherwise not much different from those on Sentosa itself. St. John is also a popular spot for fishing. Every corner of Sentosa is inundated with gift shops filled with all the plush Merlion toys you will ever need (and then some). As you might expect from a giant amusement park, food on Sentosa is (by Singaporean standards) rather pricey and mediocre. Things have, however, gotten slightly better in recent years with local chains allowed to open up outlets. For cheaper food options try either VivoCity or HarbourFront Centre. The beaches can offer some pretty wild parties on Friday and Saturday nights, especially if one of the on-again, off-again foam parties pops up. The New Year's Eve party in particular is legendary, as is ZoukOut , a massive yearly outdoor party organised by Zouk, featuring a roster of international and local DJs. Beaches, beer, bikinis and booming bass, what more do you need? There are a few nightspots of note on the mainland side of Sentosa Bridge. Sentosa is not a particularly convenient base for sightseeing elsewhere in Singapore, and most of the accommodation targets visitors looking for a simple beach holiday. However, there's a race on to complete new hotels before the casino opens, and the new monorail has improved access to the mainland, so some excellent deals can be found if you scout around. Camping on Sentosa is not allowed, and the only campground on the island has closed. Camping is possible on St. John's Island, the Sisters Islands and Pulau Hantu, but free camping permits from the Sentosa Development Corporation (tel. +65-62750388) are required. Sentosa features a sprinkling of resort hotels catering to those who want a beach holiday within striking distance of the city. Four new hotels have opened at the Resorts World Sentosa integrated resort, but while good deals are on offer, expect to deal with construction noise until at least mid-2010. All share the same reservation number, +65-65778899, and can also be booked online at Resorts World Sentosa . This page was last edited on 30 August 2018, at 17:59.